If you're a student taking a math class, there's a good chance you could benefit from a graphing calculator. Unfortunately, such devices are very expensive, but the good news is that there are several app solutions for your iPhone and iPad -- the best being Quick Graph. 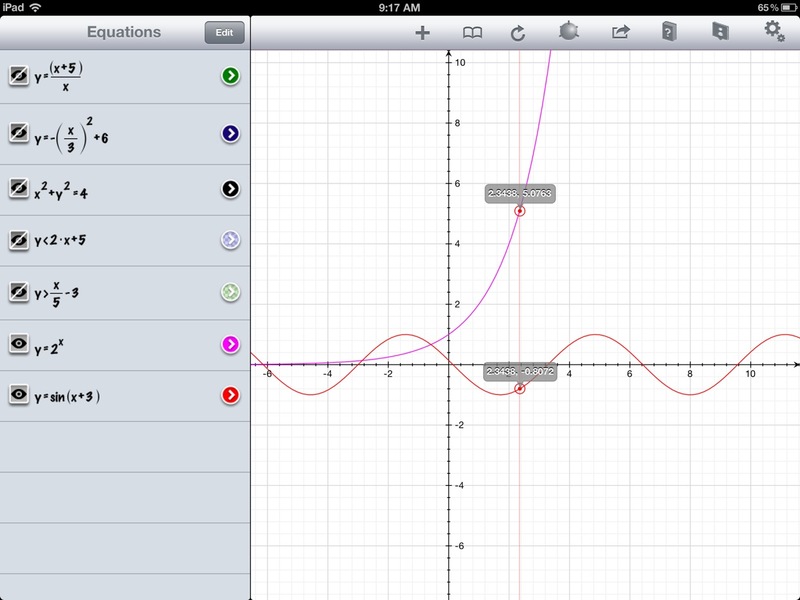 Quick Graph is a fantastic graphing calculator that lets you graph multiple equations at the same time, change their color, and also view the mathematical notation of equations being graphed by nicely formatting fractions and exponents You can toggle equations on and off by tapping the symbol that looks like an eye. 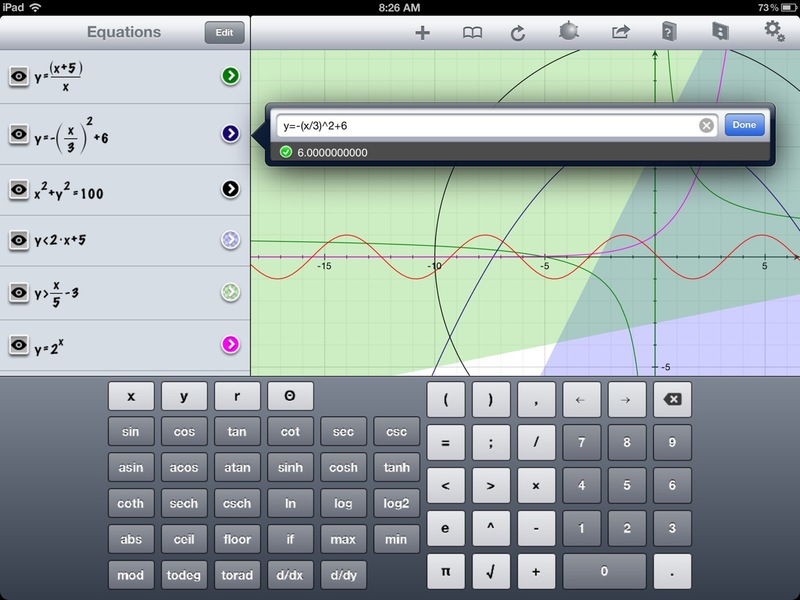 When you add or edit an equation, a keyboard pops up with math symbols, operations, and functions. There are six available variables: x, y, z, r, theta, and phi, depending on if you are graphing 2D or 3D equation in rectangular or polar form. After adding an equation, you can change its color from the 24 preset colors or from the color wheel. 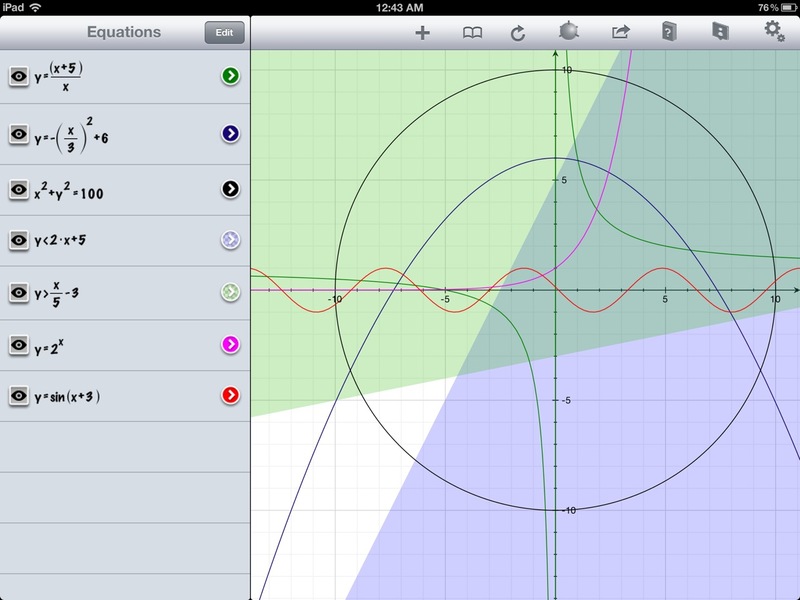 You can also adjust the opacity which is great for graphing inequalities. In addition to graphing equation, you can also solve them. For example, if you want to solve 2x+5 for x=10, you type "x=5;2x+5" and the answer will appear right below your entry. To trace a graph, simply hold your finger down on the screen and the points associated with the x value of where your finger is will pop up. If you have more than one equation, points will appear on all of them. The coordinates associated with the points will appear over the points. You can also interact with the graph by pinching to zoom in and out and scrolling to pan around. If you want to reset the window, just tap the refresh button. 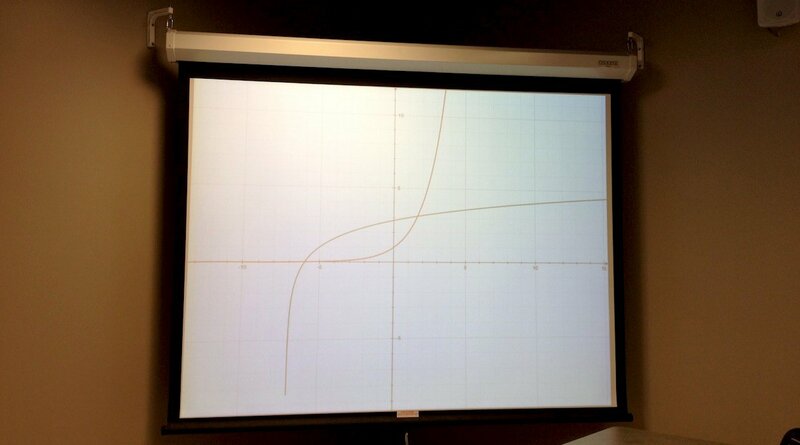 As previously mentioned, you are not limited to just 2-dimensional Cartesian graphs. 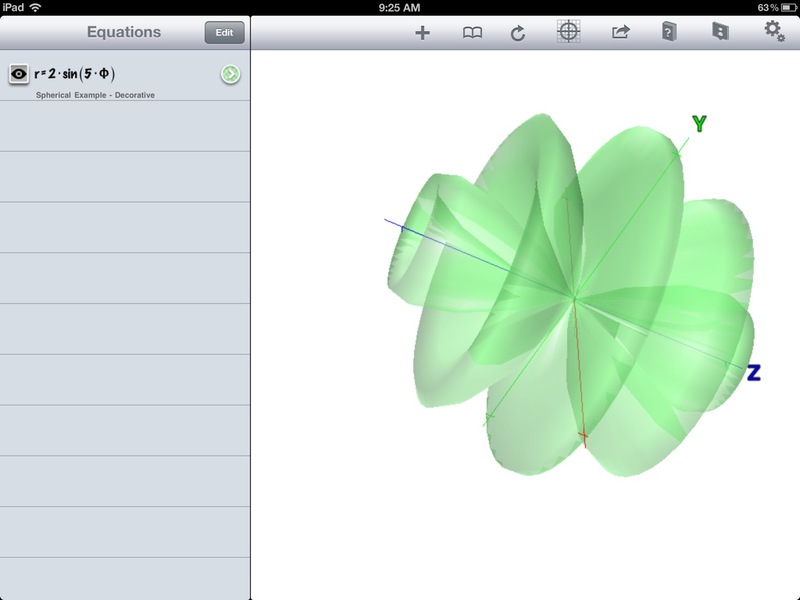 You can also graph in polar form and 3D. Interacting with 3D graphs is quite awesome. I am impressed with how smooth the Quick Graph runs when rotating the object around. One of the great (paid) features of Quick Graph for instructors is the support for VGA out. However, when projecting the app, only the graph is shown. This is disappointing because it would be helpful for students to be able to see how equations are entered since it can sometimes be tricky. Seeing which equations are graphed and the colors associated with them is also helpful for students. 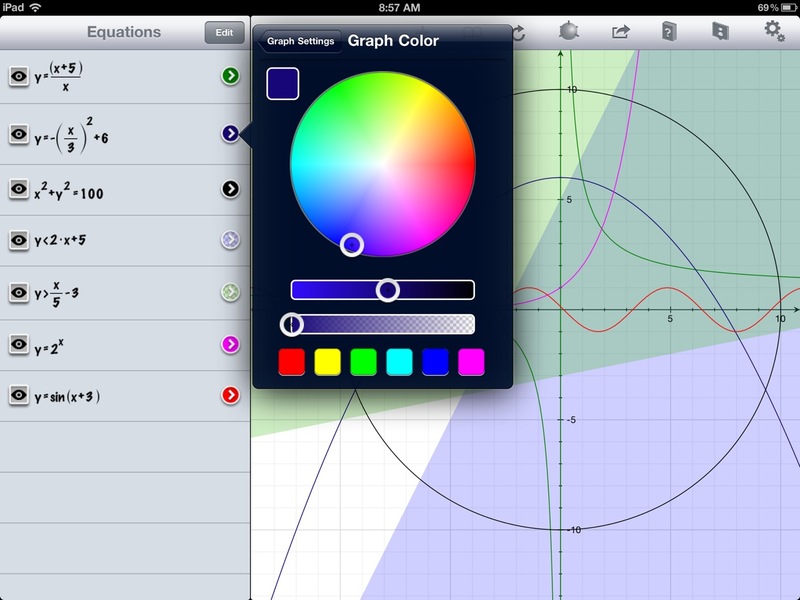 Quick Graph is a free app that includes a lot of features. However, if you want to plot more than six equations at once, graph inequalities and implicit equations, use 2D tracing and independent 2D zoom, and project the app with VGA, you'll need to pick up the $1.99 in-app upgrade. I must say, I am very impressed with how much is included for free and find the $2 purchase to be quite a steal. VGA out only displays graph. No mirroring option. 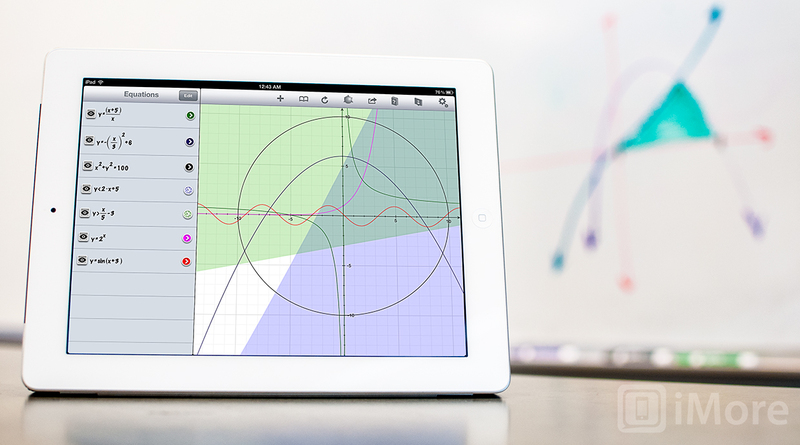 Quick Graph is a fantastic graphing calculator for the iPhone and iPad. It runs super smooth and, as its name implies, is super quick. The biggest disappointment for me is that Quick Graph doesn't yet support the new iPad's Retina display, but I'm sure it's coming, so I still recommend that every math student and instructor pick this one up.